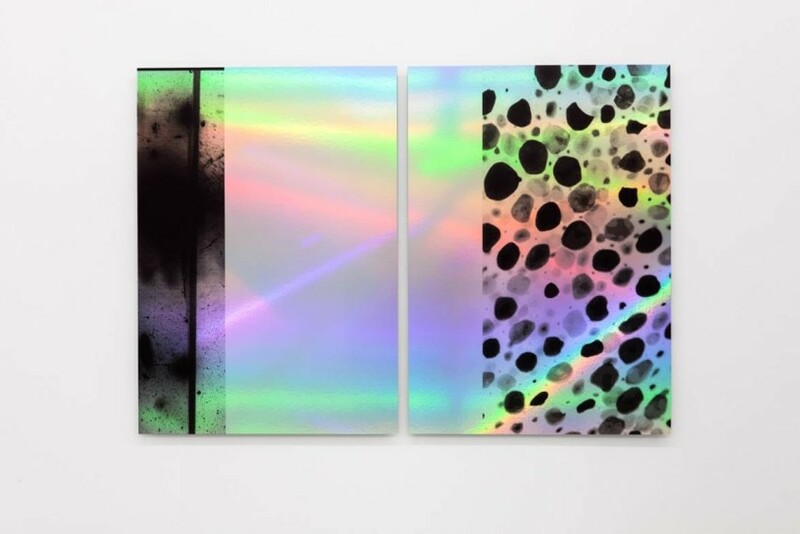 Anna Barham, flashIMG_0666_inv_chromatophore.jpg, UV print on rainbow holographic paper, mounted on aluminium, 96.5 x 143cm, 2015. Image courtesy the artist and Arcade, London. 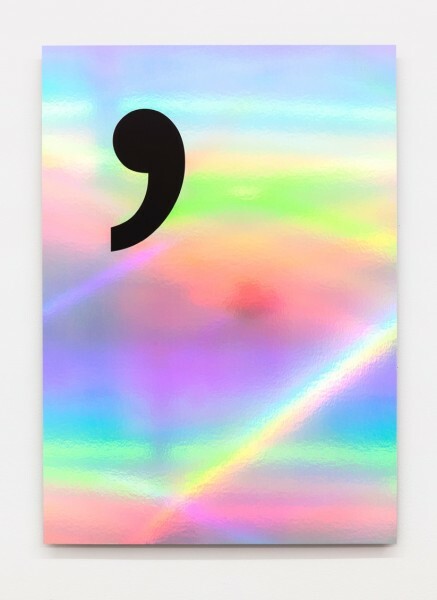 Anna Barham, Breath Mark, UV print on rainbow holographic paper, mounted on aluminium, 96.5 x 69cm, 2015. Image courtesy the artist and Arcade, London. Anna Barham, -52nthjt3k8, found video, 1’23” loop, silent, steel tubes, clamps, dimensions variable, 2015. Image courtesy the artist and Arcade, London. “Have you ever tried to clean a squid?” – reads the first line of the text work that is part of Anna Barham’s new show at Arcade gallery in Shoreditch. Well yes, actually, I have. 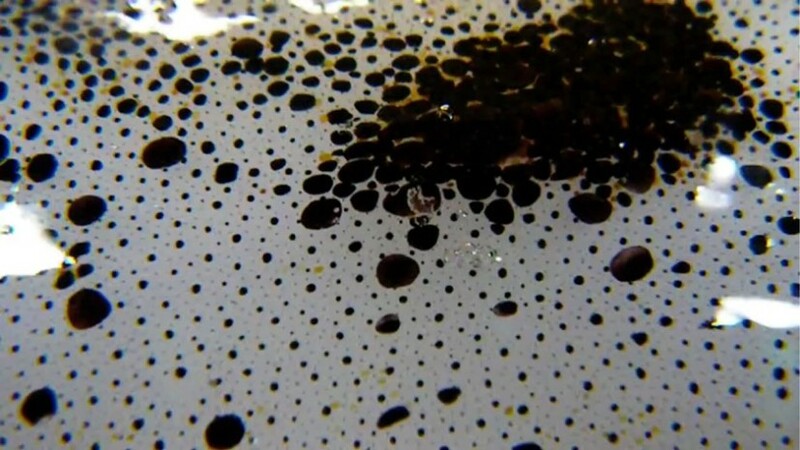 So it is possible to conjure up memories of the oozing of gelatinous innards, the flopping of goo on to newspaper, ink onto ink, and the slimy feel of tensile flesh. The two metre high text work, Score 2015, angles around one corner of the gallery like multiple newsfeeds becoming more and more garbled. The work has taken Barham years to complete, processing language through public reading groups and voice recognition software, until the original is completely degraded. The machine translation of speech to written text leads to the original sentences breaking down into an amorphous textual matter in which ‘sense’ is quickly lost. As well as reading the lines of text horizontally, one can’t help but read vertically too, watching as “reach” becomes “region”, which in turn becomes “read” and then “beat”. It is an alliterative game of Chinese whispers that leads you up and down and round the room. Barham is an artist who is increasingly getting exposure in some influential venues – Hayward Project Space last year and Fig-2 this year – so she is most definitely one to watch for the future.